This afternoon, the Baltimore Orioles released reliever Kevin Gregg. On Tuesday, the team had designated him for assignment. That night, they went out and beat the Tampa Bay Rays 9-2, moving into a tie for first place in the American League East. They beat Tampa Bay again the next night, and again the day after that. The last game of the sweep gave Baltimore 81 wins, guaranteeing the club a .500 or better season for the first time in 14 years—and with 19 games still to play. And the Orioles probably wouldn't have made it to this point without Kevin Gregg. It's a strange thing to say about a now-unemployed pitcher with a 4.74 ERA. But this is a strange season in Baltimore. The Orioles have scored 623 runs this year, while allowing 643. Baseball teams that score fewer runs than their opponents are supposed to be losing teams. According to the Pythagorean record-projection system, the bedrock tool of objective baseball analysis, a team with Baltimore's scoring profile ought to be 69-74. Instead, the Orioles are beating their Pythagorean projection by 12 games. They are 27-7 in one-run games, which simply doesn't happen. They are 13-2 in extra innings. Backup catcher Taylor Teagarden is batting .133 and has only six hits all year—five for extra bases, and three of them game-breakers. The sabermetric term of art for the quality that allows a team to overachieve this way is "luck." Luck is not an unreasonable way to describe a team being in the pennant race with Nate McLouth leading off and playing left field. Before McLouth, for a while, there was a stretch during Nick Markakis's first trip to the DL—where he joined Nolan Reimold and Endy Chavez—when the Orioles did not even have two outfielders on the active roster. Manager Buck Showalter stuck some DH/corner-infield guys out there and hoped nobody noticed. It was like watching Wile E. Coyote in the long moment after he runs off a cliff, legs churning in midair, one lingering comic beat away from his inevitable rendezvous with physics. Except now it's September, and the Orioles are still 12 games ahead of where the numbers say they should be. And if you back away from the vexing question of how the Orioles have been winning games, you can turn to the related question of how they have been losing games. Answer: with Kevin Gregg pitching. Gregg joined Baltimore last year, for two years and $10 million guaranteed, to be the closer. He blew six out of 28 save opportunities, the fans booed him, and Jim Johnson pushed him out of the closing job by year's end. Fans loathed him, in that special way that failed free-agent closers are loathed. So Gregg began 2012 as a regular reliever, maybe with a chance at earning the setup job. He had a couple of bad ones right away—a two-run homer in the 10th to lose to the Yankees, a one-run deficit in Toronto turned into a six-run deficit. On May 6, though, after five other Baltimore pitchers had come and gone in Fenway Park, he handled the 10th and 11th innings, striking out four, carrying his team securely over the threshold toward the deep extra innings, where they would win it in the 17th with an infielder on the mound and a sudden disconcerting sense that this season really might be something different. It was. Kansas City: Gregg pitched a scoreless 13th and 14th, got the win. Two days later, Washington: a scoreless 10th, another win. Then, on May 21, in his 11th appearance of the year, he came on in the seventh inning, tied with Boston 5-5. Three hits, an intentional walk, and a sacrifice fly later, the Orioles were on their way to an 8-6 defeat. Gregg took the loss. That was the end of Gregg as a conventionally valuable relief pitcher. It was a week before manager Buck Showalter would pitch him again—to handle the eighth inning in Toronto with the Orioles trailing 6-0. One meaningless, harmless inning. From that day, May 28, through his release, Gregg pitched in 29 games. In those games, the Orioles had a record of 6-23. It's not that Gregg was that bad. He just pitched in bad games. Pythagoras, meet Hippocrates: Given a $5 million pitcher who'd failed under pressure, Showalter decided to first make sure he could do no harm. So Gregg became the proprietor of garbage time. He entered games down six runs, down five, down eight, down nine. Much more rarely, he would come into a blowout that the Orioles were winning. Most of the time, he made no difference in the outcome. On August 22, he came on in the fourth inning against Texas with the Orioles losing 8-1. He served up a home run, finished the inning, and left with the score 10-1. He turned an impending 4-0 loss to the Mets to a 5-0 loss. He pitched two innings against the Twins, seeing a 10-2 deficit turn into an 11-5 deficit. But all those innings did need to be pitched. There was no sense having a good pitcher do it. The old rule of thumb is that every baseball team has about 50 games it will win no matter what and 50 games it will lose no matter what. Gregg's job was to get his team through that latter 50 games. For relief pitchers, there's a statistic called average leverage index, which measures how crucial the game situation is when a pitcher makes his appearances. The average is 1.0. Closers are mostly up above 1.5—the Orioles' Jim Johnson is at 2.1. A generic reliever like Matt Albers is at 0.92. A shaky one like Manny Acosta is at 0.69. In his final 29 games, Gregg had an average leverage index of 0.16. 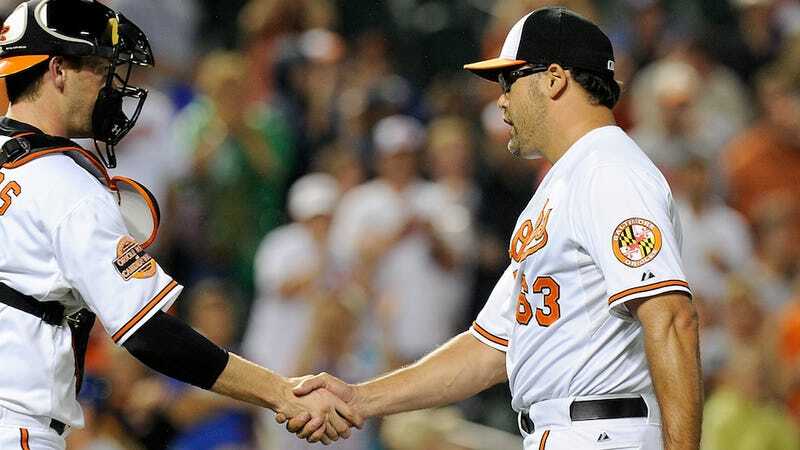 Showalter kept him as far away from affecting the result of a game as was humanly possible. In mid-July, he came on with two out in the 13th, after the Detroit Tigers had scored the go-ahead run. He threw two pitches, got a groundout, and watched J.J. Hardy and—yes—Taylor Teagarden hit home runs to tie and win the game in the bottom of the inning. It was the only time after May that Gregg would be the pitcher of record. The Orioles have a good bullpen, but not the league's best. What Showalter has been blessed with, in his season-long dance along the numerical cliff, is a predictable bullpen. Jim Johnson, Pedro Strop, Luis Ayala, and Darren O'Day have been consistently good, and they have the leverage indexes to go with it. Kevin Gregg—along with Dana Eveland (.690 average leverage index) and a rotating supporting cast—was consistently not good. Consistency is a virtue. Gregg was never helpless. He didn't serve up hit after hit till someone else had to come in and rescue him. That is what the Orioles starters would do, sometimes. And when a starting pitcher was frozen there on the mound, unable to get an out, looking a little dizzy as the other team kept circling the bases, Showalter would come out of the dugout and beckon for someone like Kevin Gregg. The game would start moving along again. The valuable relievers would attend to their sunflower seeds, saving their arms for a game that mattered. The longer Gregg pitched like this, the harder it was to hold the past against him. If he sulked, he kept it quiet. He kept pitching in his useful purgatory, and the Orioles kept winning an improbable share of their other games. So he was overpaid. It was the only bad contract on the team. Everybody makes mistakes. Essentially, Showalter used Gregg's innings as a secure waste site, a place to sequester runs so they wouldn't hurt the team. In blowouts—games where one team wins by 5 runs or more—the Orioles are 22-23, but they've been outscored by 26 runs. They've allowed 6 runs more times than they've allowed 5, or 4, or 3. The September roster expansion gave the Orioles more arms to put in the back of the bullpen, and finally made Gregg's services dispensable. When the news came down, the clubhouse mourned the loss of a "great teammate" and a mentor to his fellow pitchers when they struggled. Bobby Valentine, the Red Sox manager, called the Orioles "lucky" (ESPN appears to have memory-holed the clip). But knowing your bad relievers from your good ones helps you make your luck. Valentine has given Boston's highest-leverage appearances to Vicente Padilla and Alfredo Aceves, pitchers who have barely been better than Gregg. Meanwhile Junichi Tazawa, Scott Atchison, and Clayton Mortensen have the three best ERAs on staff, and average leverage indexes of .510, .562, and .712 respectively. Valentine's Red Sox are six games worse than their run differential says their record should be. Maybe Kevin Gregg can help them out. He's available, if they know how to use him.